It’s taken me a while to write this post. I’m angry, sad, and more than a little disheartened about keeping chickens. Last week, foxes broke into our chicken run and killed 20 of our 21 chickens, and both of our Indian Runner ducks. They dug underneath the gate to gain access, despite the fact that I’d laid chicken wire under it to prevent digging. 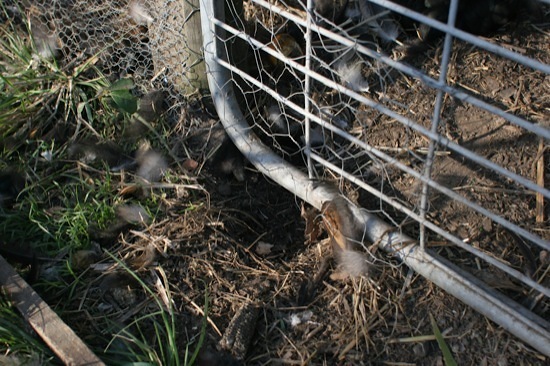 They simply tore through the chicken wire, just like they did a few weeks ago when we lost four chooks. Since that first attack, I’d secured all around the base of the pen with heavy wire, pavers, and railway sleepers. I was even putting stuff across the gate at night to prevent them from digging under it. But it wasn’t enough. They managed to move some pavers and timber enough to dig under the gate. You can see the hole wasn’t very big – not much bigger than my fist. The foxes killed everything they could get at. But they couldn’t get most of the bodies out through the small entry hole. They only took two of the smallest chickens away with them. That’s what angers me the most about this whole thing – they slaughtered everything in sight, 20 chickens and 2 ducks, just to take 2 chickens away for food. It’s such a senseless waste. The one surviving rooster wasn’t in the pen. So when I locked him up the next night, I made sure to check all the reinforcing around the pen and put a wooden pallet in front of the gate to stop anything getting under again. But that night, the foxes tore a hole straight through the perimeter fence of the pen and killed him. 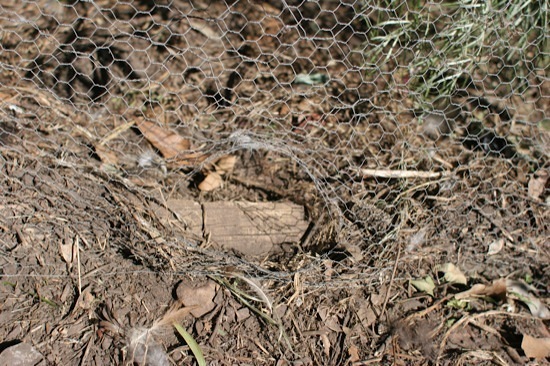 The fence had a layer of normal 2-inch chicken wire and a second layer of half-inch chicken wire over the top to keep chicks in. They simply tore through both. So we now have no chickens at all, just the two muscovy ducks that were housed separately. But you have to look for the silver lining in every cloud. I’m going to go back to the drawing board, and build some new chicken pens. They’ll have strong welded mesh fences with buried corrugated iron perimeters to stop anything digging underneath. Chicken wire just doesn’t cut it for keeping predators out. I’ll build a number of smaller pens instead of one large one. This will reduce the chance that the whole flock can get wiped out at once like happened this time, and it also gives me more flexibility in managing breeding, isolating sick birds, and looking after mothers with chicks. As an additional line of defense, we’ll also be moving up our plans to get a dog. We were originally planning to get one next year, but we’ve now started looking and if the right dog comes up we’ll grab it. We want to get a puppy so it can grow up around chickens and ducks, with strong protective instincts towards them. I’d like to hear about any good predator-proof chicken run designs you’ve seen, and would love to see photos. Please leave links in the comments below! Oh no, this is terribly sad news. I am so sorry for your loss and feel aweful for you, and especially as they came back again and got your rooster who you thought would be safe. I also keep chickens and would hate to see that happen to my girls. I have heard of dogs being used to keep foxes away and have friends on a rural property whose 2 black labs have their run surrounding their chicken run and they have had no problems with foxes. Good luck and keep up the good work. @Belinda: Yeah, I know some other people who have two dogs and the most simple, low-security chicken pen you could imagine. They’ve never had a fox attack, despite them being prevalent in the area. I’m so sorry. Foxes instinct is to kill and bury – They are from places where there is no food around for many months of the year. I’m very surprised nothing has ever happened to ours. They’re fully free range and find their own way in and out of their house. But then ours are bantams and flap up to roost high without so much as a ladder to help them up. I used to see foxes around a fair bit. Best of luck next time. I think some of us can be quite starry eyed with this modern take on living off the land for the sake of the planet. It can be pretty harsh and not everything can be controlled. On another note, congratulations on being chosen to do the permaculture course. I’ve been eyeing off April’s for a little while myself but we’re moving out of the area so I didn’t apply for Wollongong’s funding program. The chickens all roosted up high in trees, but for some reason when foxes come in chickens don’t have the sense to stay up high and safe. I had no illusions about the dangers of foxes, but didn’t realise they’d be able to break through the chicken wire so easily. They won’t find the next pen so easy! I’m really looking forward to starting the PDC. Let me know if you end up doing the course with April! On a brighter note you have inspired me to get down and add some reinforcement to my chicken run. Luckily, the night house is all steel with a steel mesh front so I think it is fox proof, but not snake proof. My edges are dug down with concrete footings, so I hope they hold – it was a real test of character lugging 30 bags of concrete down the back and mixing it. But so far it has worked. Back to work for me too – never stop improving to chicken run. @Brendan: That sounds like a lot of work to get the concrete edges! Worth it, though, to avoid this type of hassle. Foxes would find it hard to dig through concrete floors. @Vicki: Yes, they would find it hard to dig through concrete floors. However, this run is over 50 square metres, and there’s no way I’m going to spend that much money on concrete! Besides the cost, though, I don’t like the idea of keeping chickens on concrete. Dirt is more natural, allowing them to dust bathe and scratch around, and it lets us compost and grow plants within the run as well. Oh no Darren! Last week I saw big foxes walking up our street in the middle of the morning. They’re very bold at the moment! Our dog seems to have done a good job of protecting our chickens so far. I had to put him in a kennel over the w/end while we went to the snow, and felt sure we’d come back to no chickens… but we were lucky. He’s back now on guard duty. The only problem I’ve found with our dog (golden retriever) is that I can’t let the chickens free-range as I’d like to because he chases them. Then if I tie him up while the chickens are out, he can smell them all over the yard and that seems to excite him so much that HE tries to dig into the chickens. So we’ve had to give up letting them roam and just keep them in their pen. Therefore my suggestion is to build a large chicken run that is fenced off from where your dog is going to be able to roam (maybe under your fruit trees or something), but make sure its in the middle of your yard so that the dog can patrol around the perimeter (i.e. don’t put the chicken run on your boundary fence). @Gail: Good advice! We’re hoping to get a dog breed that’s good with livestock (border collie, kelpie, maremma, etc) and introduce it to the chickens from a young age so it gets attached to them. The chickens would still only free-range when we’re home, though. The dog would be able to get around all sides of the current pen, so that’s good. Hope you had fun at the snow! I feel for you. It took me several months to go back to chooks after the last massacre. My new system relies on the fact that the chooks are most vulnerable at night, so if I can create a roost where they are safe, they can avoid the predators, and still have access to greens and open areas in the daytime. This is my new roosting system. I shall wait to see how it goes through a full spring and summer before I get too excited, but so far so good. @Linda: Thanks, it’s disheartening isn’t it? I had read that post of yours a while ago, and bookmarked it for future reference. Now may be that time in the future that I need to go back and refer to it :-). That is really very sad news, I would be devastated if that happened to me. Such a horrible waste if they didn’t even eat them. I would be inclined to have night house that is either on concrete or is completely solid and up off the ground. I got an old cubby house on Freecycle which is pretty safe although if we had cunning foxes like yours a few extra modifications would be necessary. If you are coming to Sydney for any reason I have some extra Wyandotte and Marans chicks you could have. @Greenfumb: Thanks for the offer of chicks. I’m going to try to get some Australorps again, as I really want to breed those. In a way, this is an opportunity to clear the decks and start over with the flock I was working towards (we had a fair few unproductive chickens that we had held onto for sentimental reasons!). The chickens did have a night house that was secure, but I could never get them to sleep in it! They only wanted to roost in the trees out in their run, even in heavy rain or wind. I’m going to work at training the next flock to sleep inside from when they’re young. 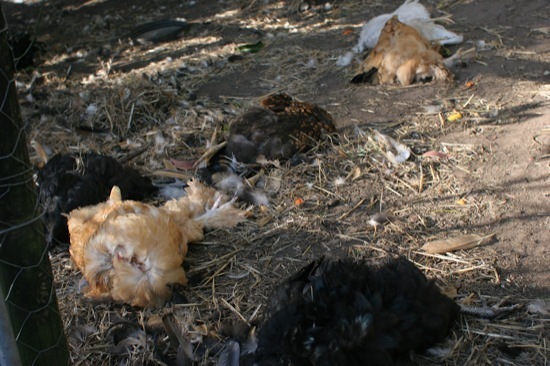 Your chicken massacre looks heart-breaking! I think you’re on the right track with getting a dog, and would only add — training is key. We walk our dog twice a day even though she can run wherever she wants since our method of walking her cements her obedience to us. Since we’re pack leader, it makes it very simple to train her that chickens are to be protected, not eaten, not to jump on the garden beds, etc. She’s just tuned in to our wishes and wants to do whatever we want. You can read our complete dog-training philosophy here: How to train a farm dog. Good luck! The concrete floor is where my chickens sleep at night on straw. In the day they can dig in the dirt etc. The concrete and secure pen is for night and sheltering from bad weather in the day. Doesn’t have to be that big. @Vicki: I have a secure coop attached to the run, but the chickens wouldn’t sleep in there. They stayed outside, roosting in the trees, no matter what type of weather! I’m going to try to train the next lot to roost inside the coop where I can keep them safer. I still don’t like concrete, though, for a whole host of reasons. Paul Healy had an article on predator-proofing in a fairly recent edition of Organic Gardener magazine. He said exactly what you’ve described, that foxes will just chew through wire (have to admit I was cynical that their teeth could do that, but there you go). There was some good info in the article (library might have the mag?). How awful for your family. A neighbour’s dog killed two of three chooks years ago and it was upsetting for everyone. By the way, where are you sourcing Australorp pullets? I can only find crossbreeds for sale. Sorry Darren that is horrible and heart breaking. @Donna: Nah, it hasn’t turned me off chooks at all. I can’t wait to get the pens beefed up and get some more! Will let you know what the PDC is like. So sorry to hear this devastating news! It’s so horrible that foxes just enjoy senseless ‘sport’ killing of chooks. After our neighbours chooks all got killed by a fox, we build our chicken house like a little fort knox, with corrugated iron (from old fencing) dug about 30cm underground all the way around. Best wishes for much success in outsmarting those foxes. @Alison: Thanks for the well-wishes. Maremmas are at the top of our list of dog breeds at the moment, although they’re not easy to find. If we can’t get one, we’ll likely go for a kelpie or border collie instead. OOh, sorry to hear that! What about pavers or concrete that is just a border around the coop? Down into the earth a bit and up half a foot or so to keep them from digging? Anyway, best of luck on a solution! @Hellann: Yep, I think we’ll take a multi-pronged approach. Dogs as a deterrent, corrugated iron perimeter buried below digging depth, heavier gauge wire for the pens, lockable secure night coop, pavers around the perimeter (stops chooks scratching the area up, too), and multiple pens so we don’t lose everything in one incident. Hopefully that’ll keep them at bay! @Inner Pickle: Sorry to hear about your loss too. I can certainly say I know how you feel! Looking forward to catching up, meeting the dogs, and plotting the downfall of the local fox population. oh, dude!! I only just saw this! We lost four last night but that’s nothing compared to this, how awful for you. Lets compare notes on fox-proofing this weekend. On the dog front, we decided against the Maremma as they apparently can be so protective of the flock they can be unfriendly towards kids. You’ll meet our Kelpie crosses on Saturday, and you’re going to love them! Sorry to hear about losing your girls. On the subject of getting a dog, there is a breed that will live with the chooks and protect them. You may already be aware. I dont know the breed but they are white and large and lovely. Maybe research it. Good luck, dont give up. @Nell: Thanks. Is the breed you’re thinking of maremma? At the end of the day, I think pretty much any medium-sized dog will keep foxes away. Foxes are very wary of trouble, and as soon as they smell a dog’s scent they’ll head off somewhere else for easier pickings. So I think the most important thing at the moment is that the dog be good with children, and not chase chickens. Hi Darren, We live in the Southern Highlands and have a lockable wooden coop that our five chooks put themselves to bed in each night. We didn’t have much of an idea when we built it, so it’s very secure and has a wooden floor. I must admit I’ve been thinking it’s a bit of a pain as we have to lock the door before we go to bed and open it again in the morning, which can be a bit annoying and makes it difficult to go away for the night, but when we do go away we take the risk and leave the small door to the coop open. The wooden coop is inside a larger pen that is fenced, more so they can’t get out. It’s not really fox proof (and I don’t know what would be after reading your story). I’m more committed to locking them away at night now though, we’ve been getting a bit lax. I’d hate for our kids to see what you saw. Thanks for sharing and good luck. @Kate: Thanks. I actually have a secure coop area on the side of the run, but could never get the chickens to go in there. They always slept outside, even in the rain! When we get new chickens, though, I’ll be training them from day 1 that they sleep inside. Over the years I have, or rather my chooks have suffered the same fate. I have been trying to find a solution to the fox problem. I have 2 dogs and even alpacas, but that doesn’t deter them. I recently heard from a chook enthusiast that she put solar garden lights around the pen which has appeared to work. Apparentley the coloured lights work even better. So off I went to KMart to purchase some. (you can get 20 for about $30) So far so good. The lights act as a deterent by flashing different colours. I hope this helps. Give it a try you have nothing to lose. @Lisa: That’s an interesting idea, similar to the foxlights but much cheaper. If you could find lights that blink intermittently or change colours, and will last all night until dawn, they might work as a deterrent. Personally, though, I’ll be spending my time and money on secure pens rather than something that may not work.